Southern Comfort glass.Condition is unused. Dispatched with Royal Mail 2nd Class signed for. Collectable Glasses. 3 Southern Comfort and one Jack Daniels. They have been in a display cabinet for years. Excellent condition. Heavy tumblers. Southern Comfort Round Bottomed Glass Great little tumbler glass Measures 3"high I have put it has used but not so sure as I ever did Is in Great Condition Please take a look at my other items Please note this item would be unavailable for collection UK Postage Only Please Thanks for looking and happy bidding! A Stunning glass tumbler with stirrer. Standing 9.5cm with a 8cm diameter and weighing 0.350cl This beautiful glass has the Southern Comfort logo on the front in White and a big thick base to keep your ice longer. Comes with free glass stirrer. This stunning glass would enhance any bar, collection or make a super gift. Will dispatch immediately and contents will be secured safely. 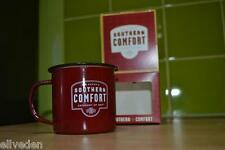 FOUR BOXED SOUTHERN COMFORT PLASTIC DRUM VESSEL. 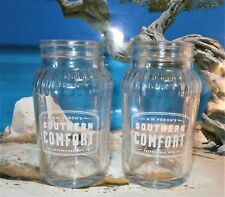 4 Limited Edition Southern Comfort Glass Mason Jar 330ml Brand New. Condition is New. Dispatched with Royal Mail 2nd Class. Beautiful round bottom. Collection available in person from Rushden, Northamptonshire, about 6 minutes way from A45, NN10 area. Over 8cm tall and around 7cm across the top each. The bottom 3 lines read:-. IT IS YOURRESPONSIBILITY TO MAKE SURE WE RECEIVE YOUR ENGRAVING DETAILS CORRECTLY AS ANY MISTAKES CANNOT BE RECTIFIED ONCE THE PRODUCT HAS BEEN ENGRAVED. To be used from. Quantity - 2 Glasses. A bit about BrewerianaUK. IT IS YOURRESPONSIBILITY TO MAKE SURE WE RECEIVE YOUR ENGRAVING DETAILS CORRECTLY AS ANY MISTAKES CANNOT BE RECTIFIED ONCE THE PRODUCT HAS BEEN ENGRAVED. Quantity - 1 Glass. A bit about BrewerianaUK. 330ml, 13cm tall and 5.5cm across the top each. Wash before use - dishwasher safe. Collection available in person from Rushden, Northamptonshire, about 6 minutes way from A45, NN10 area. 2 X Stunning glass tumblers with stirrers. Standing 9.5cm with a 8cm diameter and weighing 0.350cl This beautiful glass has the Southern Comfort logo on the front in White and a big thick base to keep your ice longer. Comes with free glass Stirrers These stunning glasses would enhance any bar, collection or make a super gift. Will dispatch immediately and contents will be secured safely. 2 x stunning tall Southern Comfort glasses. The glass for Southern Comfort long drinks and cocktails. Standing 16cm with a 8cm circumference and weighing 0.497kg These beautiful contoured glasses have the Southern Comfort logo embossed on the front, the sides of the glass has Southern embossed on one side and Comfort embossed down the other. The rear of the glass has 2cl and 4cl measuring lines and a heavy thick base. These stunning glasses would enhance any bar, collection or make a super gift. Will dispatch immediately and contents will be secured safely. Sorry bottle not included. They are part of my collection which I have decided has to go. Over many years I have collected 2000 glasses and whilst there are a few with which I would never part then they are simply taking up too much space and take too much cleaning. "M.W. Heron's Southern Comfort - Category Of One". Wash before use - dishwasher safe. Collection available in person from Rushden, Northamptonshire, about 6 minutes way from A45, NN10 area. nd Class to 1. ORIGINAL LIQUEUR. WHISKEY GLASS. SOUTHERN COMFORT. TWO SOUTHERN COMFORT PLASTIC GLASSES. A Southern Comfort round bottomed glass. Comes with original box that has some damage (see pic), but still works as a box. Had it some time but never been used. 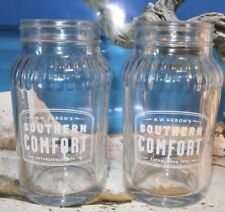 2 x new and used Southern Comfort whiskey mason jar glasses with Southern Comfort Category One Printed on the front. 'Southern' & 'Comfort' embossed on the sides. Material Glass. Item Weight 358 g.
HAS LOGO EMBOSSED ON FRONT WITH THE WORDS SOUTHERN ON ONE SIDE AND COMFORT ON THE OTHER. (LIKE YOU ARE GOING TO TAKE NOTICE OF THEM!). 2 bar runners and 6 jam jar glasses. 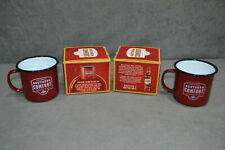 SET OF 6 SOUTHERN COMFORT BOBBLE HAT CHRISTMAS DRINKING VESSELS NEW . GET READY FOR CHRISTMAS WITH THESE SET OF 6SOUTHERN COMFORT BOBBLE HAT CHRISTMAS DRINKING VESSELS. SET OF 6 SOUTHERN COMFORT VESSELS WITH STRAWS. 2 x Southern Comfort Heavy Mason Jar Glasses. Condition is New. Dispatched with Royal Mail 2nd Class. A stunning tall Southern Comfort glass. The glass for Southern Comfort long drinks and cocktails. Standing 16cm with a 8cm circumference and weighing 0.497kg This beautiful contoured glass has the Southern Comfort logo embossed on the front, the sides of the glass has Southern embossed on one side and Comfort embossed down the other. The rear of the glass has 2cl and 4cl measuring lines and a heavy thick base. This stunning glass would enhance any bar, collection or make a super gift. Will dispatch immediately and contents will be secured safely. 2 x Southern Comfort Acrylic Pitchers New. Suppliers of breweriana and other drink related products to both the trade and general public. However should you have a problem just get in touch and we will resolve any issues. 6 x Southern Comfort drinking drums. 1 x Southern Comfort large sharing jam jar. 1 x Southern Comfort plastic robust bar top caddy for Serviettes, cocktail Stirrers etc. 50 x Southern Comfort cocktail Stirrers. These are rare Jam Jar type Mason glasses. 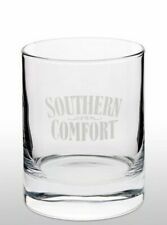 They have the new Southern Comfort logo on the front and the words "Southern" and "Comfort" up embossed up either side of the glass. 2x Southern Comfort Glasses.